China is considering a plan to buy more American coal as part of an effort to narrow its trade deficit with the U.S., according to people with knowledge of the matter. The country’s top economic planner, the National Development and Reform Commission, referred questions to the National Energy Administration; officials there didn’t reply to an email seeking comment. China this month pledged to increase purchases of U.S. energy and agricultural goods as a way to reduce its $375 billion merchandise trade deficit and diffuse an escalating trade war between the world’s biggest economies. More imports by the Asian nation would be a boon for American coal-producing states — including West Virginia — that supported Donald Trump’s presidency on the back of his pledge to revive the ailing industry. While China pursues a long-term goal of lowering coal’s share of its energy mix, the country still produces, consumes and imports more of the fuel than any other nation. It purchased 271 million metric tons from overseas last year, according to customs data. The U.S. exported about 3.2 million short tons to China, data from the Energy Information Administration show. 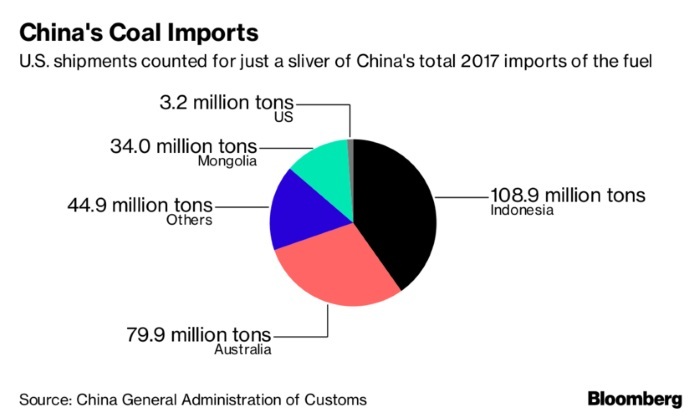 The total value of U.S. coal exported to China last year was about $395 million, based on an average price of $122 per ton, Andrew Cosgrove, a Bloomberg Intelligence analyst said in an email. About 90 percent was metallurgical coal, which is used to make steel, he said. 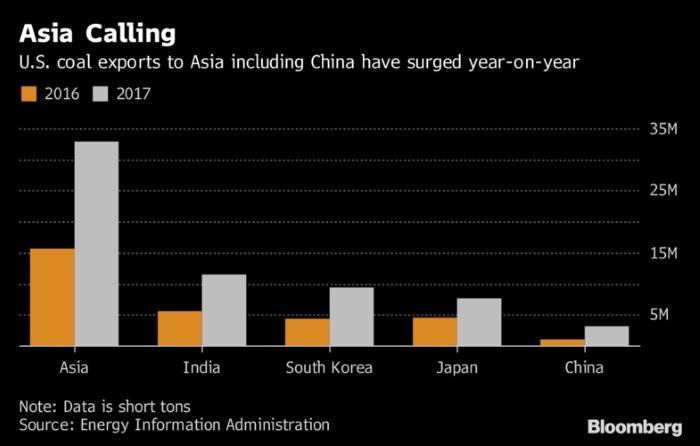 The U.S. more than doubled coal exports to Asia in 2017 to 32.8 million tons, while total overseas shipments rose 61 percent year-on-year. India was the biggest importer of thermal coal, used in coal-fired power stations, according to the EIA. Trump has promised to revive the U.S. coal industry by lifting restrictions on it. In February 2017, he signed legislation repealing a regulation meant to protect streams from the effects of coal mining. In October, his administration proposed the repeal of the Clean Power Act, which was designed to cut carbon dioxide emissions from electricity generation. West Virginia was the second-biggest coal producer in the U.S. after Wyoming in 2016, accounting for 11 percent of the nation’s total output, according to the EIA. All of the state’s coal is bituminous with varying sulfur content, and about 75 percent is shipped out to other states and countries. While Trump has since backed away from the economic truce reached between Beijing’s special envoy and the White House in Washington on May 19, U.S. Commerce Secretary Wilbur Ross plans to head back to Beijing early next month to continue talks. China has already said it will cut the import duty on passenger cars and there’s speculation more tariff reductions are on the way. It wouldn’t be the first time that China’s trade policies affected Trump-supporting parts of the U.S. in particular. As the trade war ratcheted up earlier this year, China said it was considering harsher tariffs on soybeans, potentially harming the American farming industry that had backed the president, before walking back from the plan as the truce was reached.